Practical LaTeX covers the material that is needed for everyday LaTeX documents. This accessible manual is friendly, easy to read, and is designed to be as portable as LaTeX itself. A short chapter, Mission Impossible, introduces LaTeX documents and presentations. Read these 30 pages; you then should be able to compose your own work in LaTeX.ÃÂ The remainder of the book delves deeper into the topics outlined in Mission Impossible while avoiding technical subjects. Chapters on presentations and illustrations are a highlight, as is the introduction of LaTeXÃÂ on an iPad. Students, faculty, and professionals in the worlds of mathematics and technology will benefit greatly from this new, practical introduction to LaTeX. 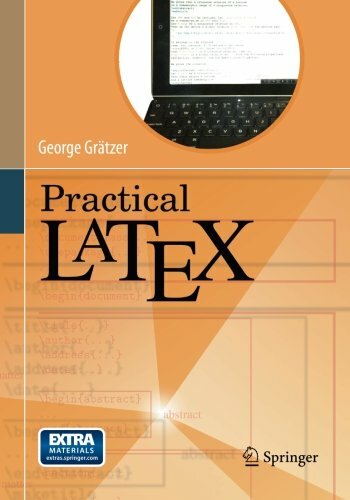 George GrÃÂ¤tzer, author of More Math into LaTeXÃÂ (now in its 4th edition) and First Steps in LaTeX, has been a LaTeXÃÂ guru for over a quarter of century. About: Practical LaTeX covers the material that is needed for everyday LaTeX documents.